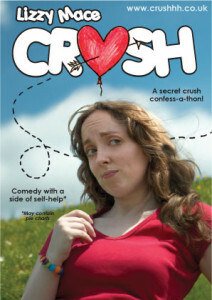 Have you ever had a crush on someone and never dared tell them? What if you contacted the object of your affection years later and finally confessed? What if you contacted everyone you’ve ever had a secret crush on and told them all? Lizzy Mace decided to do just that, and in her debut solo show she invites you to share the highs and lows with her – the toe-curling embarrassment, the surprising responses, and absolutely everything in-between. Re-telling the experience through stand-up, sketches and video, Lizzy explores crushes from every angle. She might even throw in a pie chart for good measure. Come and find out what happened, and what she discovered about that whole crush conundrum, in the Banshee Labyrinth Cinema Space throughout August at the Edinburgh Festival Fringe. Comedy with a side of self-help: you’ll laugh, you’ll cringe, you’ll nod in agreement. Price: FREE non-ticketed. Thanks to PBH’s Free Fringe, run by performers for performers on a co-operative basis; it’s a good deal for the public, the performer and the venues. Woop! So that I’m not too horrifically terrified the first time I step on-stage in Edinburgh, I’m holding some previews for the lucky folk of London and Cambridge at the end of July.